Most kids visiting Wilmington want sand and waves, but my son Rowan, eight years old, wanted only one thing: to see the carnivorous plants at Carolina Beach State Park. 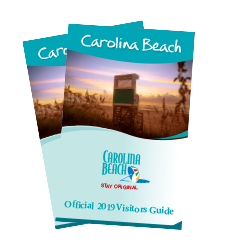 Home to plenty of trails, a secluded campground, and a busy marina, this park is a great place to stay while fishing or enjoying Carolina Beach, but we came for its unique ecosystem, one of the few places in the U.S. that the Venus flytrap grows wild. As we set out on the Flytrap Trail, my wife, Jenn, guided us with a rough map of the trail that she’d gotten at the park’s Visitor’s Center. My four-year-old son, Sylvan, kept looking through the wrong end of the binoculars, laughing as he made me appear tiny. Growing in a cluster, these pitcher plants were greenish-yellow tubes with a flap at the top; bugs are lured in and then unable to climb back out. Inspired now, Rowan produced a black magnifying glass, lay on the boardwalk with Jenn, and investigated the nearby ground. 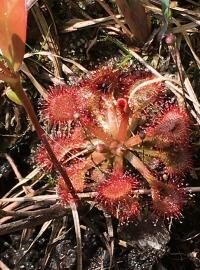 Looking small, not large, that’s the key to finding these plants and what led to the next treasure: sundew. Positioned at the base of the pitcher plants, sundew has pinkish protrusions that eternally glisten; it seems to always hold fresh raindrops. But still, the Venus flytrap, the most famous plant in the park, eluded us. Wrongly-turned binoculars and intense magnified stares didn’t help. What were we doing wrong? Rowan swore to return the next day and not leave until we’d found the flytrap. I was pretty sure we’d never find it, so all I could hope was Rowan would forget, but some time that night, Rowan woke up in the tent, whispered, “Venus flytrap” and then started laughing. The Visitor Center was the key. The woman working said we’d missed the flytrap tour (weekends at 10am), but she said there was a secret way to the flytraps. Something about a wooden structure, and behind that a trail of sawed-off stumps. He got distracted and I went on ahead, and out of my periphery, I caught it: a Venus flytrap. It grew along the edge of the trail, smaller than the palm of my hand, and its leaves were open, the teeth on them clearly visible. I called the others, and they moved swiftly over the stumps to crowd around and admire it. Once we’d seen one, more flytraps seemed to materialize from the landscape. In the end we found at least five, all growing along the edge of the trail, and Rowan even helped another couple locate the plants. We didn’t touch the flytraps of course, as a flytrap leaf touched too much will blacken and die, but even more, theft and poaching of naturally growing Venus flytraps is a felony in North Carolina. Not that we were tempted. Luckily, we’d seen enough Scooby-Doo to know instinctively that we shouldn’t get too close. Who knows when a three-inch flytrap might morph into a human-sized carnivore? Better to look than to be eaten, and looking preserves the beauty for others to enjoy. I never thought we’d be taking pictures with a plant, as if it were a fifth member of the family, but that’s exactly what we did. We’d come a long way to find something small and special. 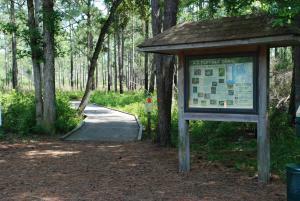 Carolina Beach State Park is located at 1010 State Park Road, Carolina Beach, North Carolina. Click here to learn more about the park’s unique ecology. Hike NC Earth Day Trail Hike (April 21, 2018). Join a ranger-led hike of Carolina Beach State Park’s newest trail, Sand Live Oak Trail and learn about plant communities along the Cape Fear River. This hike is 3 ½ miles and will last about 2 ½ hours. Meet the park ranger at 12:30pm at the end of Nature Trail Lane in the Flytrap Trail parking lot; wear good hiking shoes and bring water, insect repellent and sunscreen. 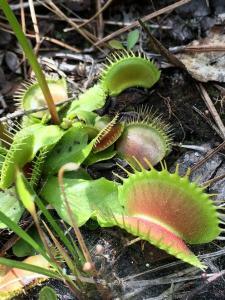 Flytrap Frolic (April 21, 2018) celebrates Venus flytrap and other carnivorous plants that grow at the Stanley Rehder Carnivorous Plant Garden in nearby Wilmington. 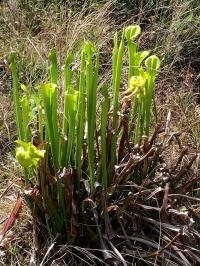 Carolina Beach State Park leads free guided carnivorous plant hikes on Saturdays and Sundays, spring through fall. Click here for a schedule.